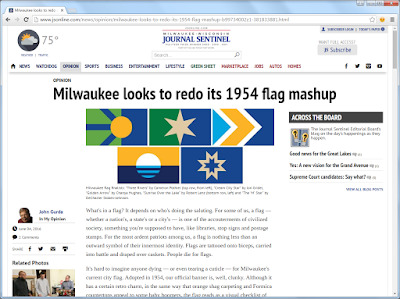 Borchert Field: Journal Sentinel: "Milwaukee looks to redo its 1954 flag mashup"
Journal Sentinel: "Milwaukee looks to redo its 1954 flag mashup"
What's in a flag? It depends on who's doing the saluting. For some of us, a flag — whether a nation's, a state's or a city's — is one of the accouterments of civilized society, something you're supposed to have, like libraries, stop signs and postage stamps. For the most ardent patriots among us, a flag is nothing less than an outward symbol of their innermost identity. Flags are tattooed onto biceps, carried into battle and draped over caskets. People die for flags. It's hard to imagine anyone dying — or even tearing a cuticle — for Milwaukee's current city flag. Adopted in 1954, our official banner is, well, clunky. Although it has a certain retro charm, in the same way that orange shag carpeting and Formica countertops appeal to some baby boomers, the flag reads as a visual checklist of items that represented Milwaukee to our grandparents. A gear for industry? Check. A barley stalk for beer? Got it. City Hall for good government? Front and center. Down the list it goes: a church, smokestacks, a boat, County Stadium, the Arena, an Indian chief, a military service flag (yes, a flag on a flag), an oil lamp, and waves on Lake Michigan. If it were any busier, Milwaukee's flag would die of sheer exhaustion. Small wonder that the campaign for a new Milwaukee flag has generated such enthusiasm. Nearly two years ago, a young graphic designer named Steve Kodis heard a podcast on flags presented by cultural pundit Roman Mars. His interest quickened, Kodis started to investigate. He discovered that Milwaukee's flag was a visual antique and resolved to try, if he could, to bring the city's banner into the 21st century. 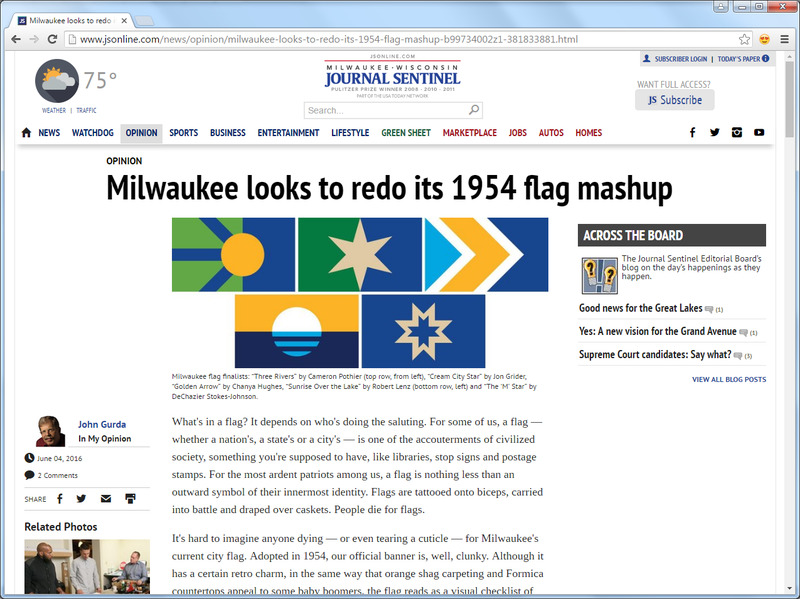 (How many people knew Milwaukee even had a flag is open to question.) Kodis' motivation was simplicity itself. "I'm proud to be a Milwaukeean," he said. "A great city deserves a great flag." The young man soon became Milwaukee's own Betsy Ross in blue jeans, but he wasn't toiling alone. Greater Together, a nonprofit group that promotes diversity in Milwaukee's creative community, joined the cause, and word of a design contest began to spread by word-of-mouth and social media. The result was a powerful example of civic engagement. Hundreds of Milwaukeeans, many of them young adults, spent hours crafting what are basically expressions of love for their city. The contest generated more than a thousand flag designs submitted by well over 500 individuals vying for nothing more tangible than bragging rights. I was one of the volunteer judges charged with choosing five finalists from that mountain of submissions. Our group included three young designers (including Kodis, now 29) and two older history types: myself and our leader, Ted Kaye of Portland, Ore. Kaye was there as a specialist whose title is hard to spell and even harder to pronounce: a vexillologist, or flag expert. The five of us spent seven hours on a sunny spring Saturday inside the Hanson Dodge ad agency on Buffalo St. The process was orderly and interesting. We began by spreading printouts of the submissions in rows of two across the hardwood floors — a lineup that was ultimately longer than two football fields. The entries had a remarkably consistent color palette — lots of blue for water, plenty of cream for brick — and a strong emphasis on threes, for Milwaukee's three rivers, three pioneer settlements and three founders. Each judge then picked the designs he or she found most appealing, which narrowed the field to about 120. The next step was to group those choices thematically — gears, waves, stripes, maps, stars, etc. — and pare them down to 50 semifinalists. From that pool, after plenty of spirited but respectful discussion, we picked five designs to be submitted to the public in an online poll. By the time we finished, all of us were convinced that any one of the finalists could creditably represent our city. I left the Third Ward that Saturday evening with a new respect for the various Milwaukeeans who had tackled the same task in earlier years. Picking a flag design is not easy. The city lacked an official banner for the first 108 years of its existence, and it was not for lack of trying. As documented by Chance Michaels, there were attempts to pick a flag as early as 1897. That effort came to nothing but, generation after generation, the campaign was renewed. In 1927, for instance, Milwaukee considered a design submitted by "public-spirited citizens" that featured "a field of Alice blue on a double silk background, with the city seal in the center, imprinted in golden orange." Although it was described in the press as "Milwaukee's new civic flag," the design was shunted over to the Police Department and ultimately abandoned. In 1942, not long after Pearl Harbor, Ald. Fred Meyers declared that Milwaukee needed a banner by the time of its 1946 centennial. "As a great convention city," Meyers opined, "as a city whose factories are making parts for every type of weapon and other materials used by our armed forces, as a city with an outstanding enlistment record in the armed forces....Milwaukee should have an official city flag." Other concerns took precedence, notably World War II, and it was not until 1950 that Milwaukee looked up and noticed that its flagpole was still empty. Meyers renewed his push, launching a contest that drew more than 150 entries. None proved completely satisfactory. Four years later, Fred Steffan, another alderman, took the odds and ends from the 1950 finalists and created a composite design. That's our current flag, and the Common Council made it official on Sept. 21, 1954. The decision was greeted with a collective yawn. The Milwaukee Sentinel ignored the story completely, and the Journal gave it all of two sentences in the local section. The afternoon paper did donate copies of the flag to every Milwaukee junior and senior high school, hoping they would "hang in a prominent place and be used as a basis for study of Milwaukee's civic and cultural history." As the 1954 flag slipped steadily out of date — smokestacks went cold, the Braves left, breweries closed and lake traffic diminished — there were periodic attempts to breathe new life into our civic banner. A 1975 contest almost yielded another study in composites. According to the Milwaukee Journal, that year's entries leaned heavily to "beer steins and beer bottles, the Summerfest smile, the Harbor Bridge, the Mitchell Park Conservatory and the lakefront." The judges recommended that the various elements "be incorporated into a single flag," but cooler heads prevailed. The issue lay dormant until 1991, when yet another attempt proved abortive. A 2001 contest that drew 105 entries ended with a unanimous verdict of "none of the above." Fifteen years later, the current campaign already has generated more discussion, more publicity and more ideas than all the preceding contests combined. Not surprisingly, it also has prompted a new surge of interest in our old flag. Even though the 1954 banner was largely unknown and unflown, the retro look is cool these days, and the existing flag, I freely acknowledge, is endearingly tacky. In some quarters, the current contest is a hipster plot to strip Milwaukee of a valued icon. I have no such concerns. The process has been transparent and the spirit of the organizers openhearted throughout. The contest yielded five strong finalists: an "M" star, a lake sunrise, three rivers, a chevron and a six-pointed star. They may seem simple, even generic, at first, but that was the intention. A good flag, all five judges agreed, should in fact be simple — as well as memorable, colorful and specific to its setting. Milwaukee's 1954 banner is essentially a time capsule of artifacts from a dead generation. Led by our younger residents, the city is ripe for a new design that evokes our place rather than describes it, that provides us with inspiration rather than an inventory. What's in a flag? More than meets the eye. A new banner won't bring back Allis-Chalmers or turn the north side into River Hills, but it can give Milwaukee something valuable nonetheless: a touchstone of identity that all of us can salute. Thanks for the mention, Mr. Gurda (although I hate to sound churlish, but could you include a link next time?). Drop me a line sometime - I'd love to talk Milwaukee history, vexillological, baseball or otherwise. And thank you, everyone, for indulging me this little detour away from Milwaukee's wonderful diamond past. I promise one more digression, when they announce the winner of the People's Flag contest on the 14th. Until then, there'll be baseball starting on Tuesday, when contributor Paul Tenpenny will bring us a story of former Brewer Jack Weisenburger.